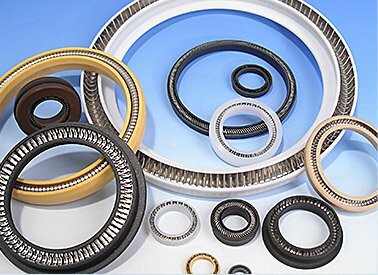 AHPSeals’ Spring-energized PTFE Seals are used for linear or reciprocating rod and piston sealing applications, for rotating shafts as rotary seals, and for static and face sealing applications. They are typically used in areas where elastomeric seals cannot meet the frictional, temperature, or chemical resistance requirements of the application. Seals made of PTFE have exceptional resistance to high temperature, chemical reaction, and corrosion, and provide the lowest coefficient of friction of all sealing materials. Compared to other elastomeric sealing materials (e.g. Polyurethane, Nitrile and Viton® Rubber), PTFE is a plastic material and offers little or no memory after being compressed; therefore, seals made out of PTFE need to incorporate an energizing element made of an elastomer material, usually rubber (rubber-energized) or a metal spring (spring-energized). AHPSeals is utilizing a variety of PTFE (PTFE, Fluoropolymer) compounds, spring types and materials, lip configurations, and seal designs to meet the requirements of the most demanding seal environments. * Maximum values depend on seal material, seal configuration and working environment. For maximum seal life expectancy, do not operate your seal beyond 50% at the combined limits of the working conditions. Please consult our engineers or call 1-800-283-7140 for advice. At American High Performance Seals, we pride ourselves on manufacturing the most durable Spring-energized PTFE Seals. Utilizing advanced materials designed specifically to offer our customers maximum durability, we manufacture the widest array of seals to meet the full range of industry fluids, temperatures, surface speeds and pressures. For your Seal application please contact our engineers to help you in specifying a seal that’s best for your situation. Special DesignsOther seal designs and materials for unique applications are available, contact us for information regarding hardware design requirements and additional specifications..